Words cannot express how much I love The Charted Cheese Wheel from Popchart Labs. This illustrated collection of 66 cheeses is broken down by animal and texture. In addition to just being wonderful to look at, it's a great idea-generator for future wine and cheese parties. I'm getting mad cravings for Pont-l'Évêque and Pecorino Sardo just glancing at the chart. The brilliant designers over at Popchart Labs never stop coming up with infographic prints I want to buy. Thinking this Cocktail Chart of Film & Literature would also look nice in the office or living room. Anyone who visits my apartment is able to tell immediately that I'm a little obsessed with maps. I have maps everywhere: framed and hung on walls, on postcards tacked to my office bulletin board, even as Jenga tile magnets on my fridge. And if my map-making design class in May goes well, I'll have a few hand-drawn ones to add to the walls too. This embroidered map is a recent addition to my map decor, to show a little love for my hometown in light of recent events. It's from Vintage Refashioned on Etsy, who is donating part of the proceeds to the Red Cross. Right now the hearted map is just propped up on the bookcase unframed, but it might move around a bit. And I may need to get the matching Brooklyn one too. 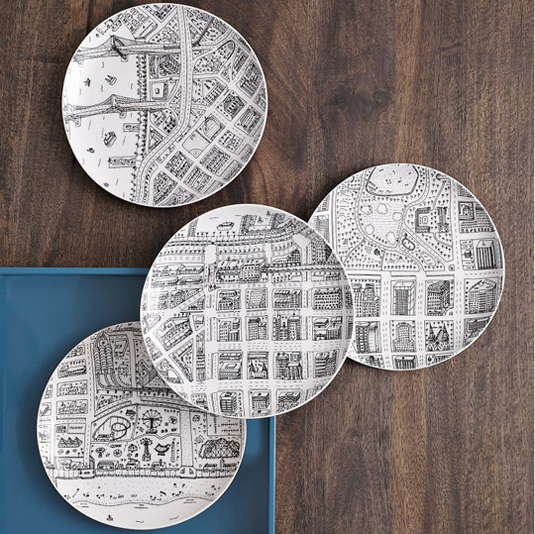 I recently saw these New York neighborhood plates on West Elm’s site and fell in love immediately. The whimsical black-and-white line illustrations, drawn by artist James McNally, depict Dumbo, Coney Island, Central Park, and Chelsea. They remind me of both old Saul Steinberg illustrations for the New Yorker and vintage children’s books. If he does a part II series with Park Slope and Red Hook plates, I would seriously consider using them as wall decor.